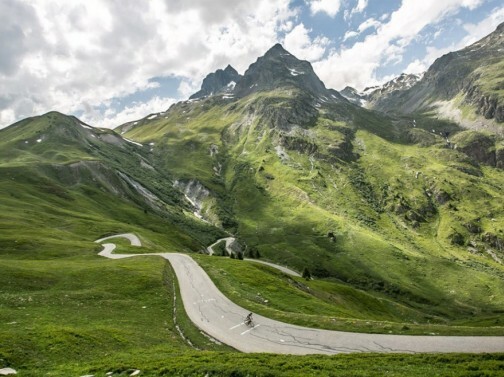 The awe inspiring French Alps sit at the very heart of this 9 day cycling adventure with an itinerary that takes French Alps cycling holidays to a whole new level. Leaving the beautiful Swiss city of Geneva your trip starts with a bang as you make your way south to France’s infamous Haute Savoie region. Views of Mt Blanc welcome you to this breathtaking part of the world with its soaring snowcaps, jagged ridges and pristine lakes. Epic climbs define this part of your journey so bring your ‘A Game’! Continue your traverse over the Alpes de Haute Provence and Alpes Maritimes and enjoy the rewarding challenge of the leg burning passes of Col du Galibier, Alpe d’Huez and Col d’Izoard to name just a few. Enjoy a well earned rest in the evenings while you enjoy French hospitality while staying in the picturesque alpine villages of Megeve, Modane and La Grave. The remote backroads of Provence await as you leave the the Alps and head for the French Riviera and the sparkling turquoise waters of the Mediterranean. Your final descent and your final destination is the palm lined streets of Nice. This nine day French Alps cycling tour is unrivalled and is a once in a lifetime cycling experience. Its incredible, challenging and extremely rewarding. Come prepared for consecutive days of distances of over 100km. Long climbs are a regular part of your days journey with some steep sections. This French cycling experience has been created for strong cyclists or riders that are in good physical condition. This ride is perfect for those searching for an international riding trip that provides both a mental and physical challenge. In relation to the climbing aspect, you can expect elevation gains of 1000m+ per day. You will be warmly greeted by your guides who will meet you at Geneva airport and transferred to your hotel. Your guides will drop you off at the Nice airport for your flight home or trip extension.